Meteorological spring begins tomorrow and astronomical spring is only 3 weeks away, but it appears our furry friend Phil may have been on to something a month ago! Another in a seemingly never-ending chain of Arctic outbreaks will push through the Mid-South late this weekend with yet another round of winter weather possible. So far the majority of the metro has been spared the worst of the snow and ice this winter, though our friends in Tipton County would gladly invite us up to help in debris cleanup from significant ice a couple of weeks ago! I've also said that the first weekend in March sometimes brings us winter surprises. It appears this year the month will start off like a lion! While most of the weekend should be decent with low rain chances and well above freezing temperatures, the period of concern is late Sunday into early Monday. During the day Sunday, an Arctic front will drop through the area, causing temps to plummet from around 60 or a little higher early Sunday afternoon to the lower 30s by Sunday evening. Most precipitation with this system will be along and behind the front, as temperatures are falling. As always in these scenarios, how quickly the precipitation exits versus when sufficient cold air arrives to change precip type over to a wintry mix will be the key. 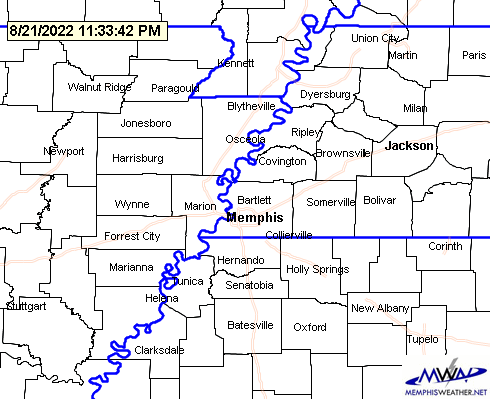 As of 2:20pm, the National Weather Service has issued a Winter Storm Watch for northeast AR, the Missouri Bootheel, and west TN generally north of I-40, including Tipton and Crittenden Counties in the metro (blue counties in the map below). So how do we expect it will play out? Showers will be likely during the day Sunday, the front will move through by mid-day, and temps will fall during the afternoon. Given fairly consistent model data (though all could and will still adjust some between now and Sunday night), it appears that we'll be in the mid 30s by 6pm Sunday along the I-40 corridor, then continue to fall below freezing a couple of hours after that. Forecast temperatures at noon Sunday, according to the NAM model. Notice the sharp divide between 60s in the metro and 30s in northeast AR along the front. 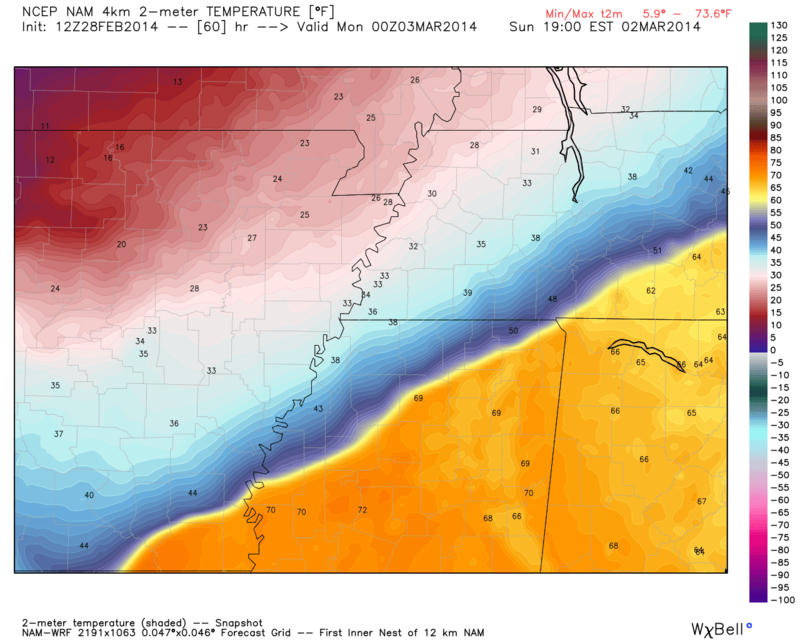 Forecast temperatures at 6pm Sunday, according to the NAM model. The front is south of the metro by this time. The amount of precipitation falling in cold air is the biggest question mark, but model data currently points to anywhere from about 1/3" to nearly an inch in the metro. 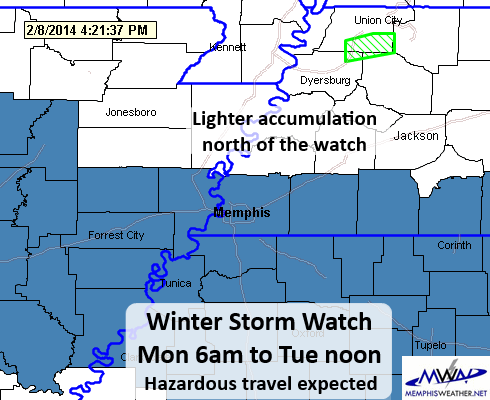 The Winter Storm Watch calls for up to 1/4" of freezing rain and 1/2" of sleet, plus minor snow accumulations, but that is for the entire watch area with higher amounts expected in northern areas and lesser amounts across the metro, including Memphis and Shelby County. These estimates are highly subject to change. Most of that will fall before midnight, tapering off after midnight with little additional precip. As mentioned, precipitation type at this time appears to be mostly ice, perhaps ending as light snow. As regular readers of the blog know, freezing rain is much more hazardous than sleet as it glazes exposed surfaces, creating an ice skating rink. Sleet is the type that bounces and, though slippery, does have a little traction to it and does not adhere to power lines like freezing rain. If we are going to get ice, we want sleet. Forecast precipitation amounts (liquid) from the NAM model between 6pm-midnight Sunday night show more than 0.25" across the metro. The NAM is faily conservative on the amount during this time period as compared to other models. We'll continue to closely monitor the event as it gets closer and provide updates as we have new information or confidence increases one way or another. For now, prepare for the possibility of icy conditions by early Sunday evening that could last into Monday if enough falls. Temperatures on Monday will be frigid - starting in the 20s and only rising to the mid 30s with a gusty wind that will keep wind chills in the teens to low 20s. Fortunately, the extended outlook shows a fairly quick warm-up after a couple of cold days to start the week. Follow our social feeds (listed below) and blog for the latest info and don't get sucked into "hype-casts" based on a single model or an untrusted (or unknown) source. Cold weather returns along with some precip tonight - will winter ever end?? We are receiving lots of reports of sleet and even a little thunder in the area this evening as freezing levels are low and air fairly dry, promoting sleet development. Temps remain in the 40s at this time and will fall into the 30s, but no travel issues are expected this evening due to sleet. Following a beautiful weekend that felt an awful lot like spring, I got questions like "is spring finally here?" and "is winter gone for good?" My response: "It's still February." Alas, Mother Nature is throwing a stark reminder of that our way in the coming week. The only good thing about cold weather this time of year is that typically it doesn't last as long and isn't QUITE as cold. Of course that is all relative... It has been a long and cold winter in the Mid-South! An Arctic cold front moves through the region tonight, shifting wind to the north and becoming gusty, while also causing temps to plummet. Meanwhile, some precipitation is expected to move through the area as well. Computer models differ slightly on the placement and timing of precipitation, but all seem to agree that most of it will fall across north MS, while the southern half of west TN and east AR could see light precip prior to snow-cold air arriving. Thus, there is a low chance that light rain could briefly change to light snow or sleet for a couple hours after midnight before ending before dawn in the metro. Areas just south of the metro in north MS have a slightly better chance of seeing light snow, but even that is not much. The latest NAM model output indicates precip falling along and south of the TN-MS line at midnight with the 32 degree line (blue line) dropping south across the metro. A brief changeover to snow is possible if this scenario pans out. 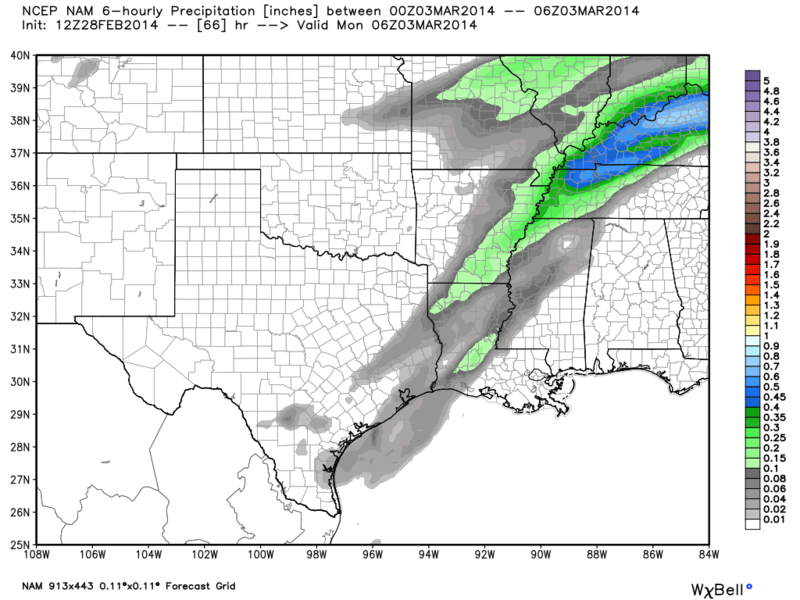 Other models keep the precip a little further south. Temps will fall to the upper 20s by dawn, so any light precip that falls overnight COULD freeze or create black ice on elevated roadways or objects, though a gusty north wind will help in the drying process and most roadways will be plenty warm enough to keep from freezing. The probability of travel issues in the metro Wednesday morning is low. Forecast temperatures from the NAM model at 7am Wednesday morning. Wind chills will be in the teens. Cold air sticks around the rest of the week with highs on Wednesday in the 30s and wind chills in the 20s despite abundant sunshine. Lows Thursday morning drop well into the 20s, perhaps some upper teens in the coldest outlying areas as wind goes nearly calm. Mid to upper 40s are expected Thursday and Friday afternoon and we'll have to monitor Friday morning for possible precip into sub-freezing air, though it appears at this time as though rain would hold off until temps were well above freezing Friday. Warmer temps (50s and 60s) are expected this weekend with low rain chances before yet another major cold front arrives Sunday or Monday, depending on which model solution plays out. This front will bring a potential for thunderstorms and then another blast of cold air as we start March off like a lion. One more time, we'll monitor how fast the cold air moves in on the heels of precipitation departing. Click here for the complete MWN Forecast, which is highly subject to change for this weekend's system. NOAA predicts equal chances of above/below normal March temperatures so hopefully we can shed winter and get some spring cleaning done in March! March 2014 temperature outlook from NOAA indicating below normal temps should stay to our north with equal chance of above and below normal temps across the Mid-South. As winter finally begins to back off we see ourselves getting into a weather pattern that presents the threat of severe weather. This is not a huge surprise, because the polar jet stream has the tendency to hang around our area through late winter. Any warm-up that occurs is likely to be a brief and could be followed by severe weather due to the highly active pattern that winter brings along with it. For this reason you should be prepared for severe weather in EVERY season. (Note: this week is also Severe Weather Awareness Week, [SWAW] so the timing is rather coincident.) Although winter is not typically thought of as severe weather season, the beginning and end of winter certainly bring the potential. Let's take a closer look at Thursday's setup,. The Weather Prediction Center short-term forecast shows a developing low-pressure system in eastern Colorado by Wednesday evening. This is our area of interest as the surface low and associated upper-level trough progress east. The system will tap into plenty of Gulf moisture as southerly winds at the surface advect plenty of warmer air quite a ways northward. By Thursday morning there will be a good amount of moisture to work with at the surface which is a key ingredient for thunderstorms and severe weather. Dew points look to already be in the 60's by morning, likely continuing to slowly increase until the arrival of the cold front. The primary reason precipitation could remain limited up until the arrival of the cold front and associated squall line is due to mid-level dry air. As you go up in the atmosphere, the wind begins to shift toward the west until it loses that moisture feed from the Gulf. 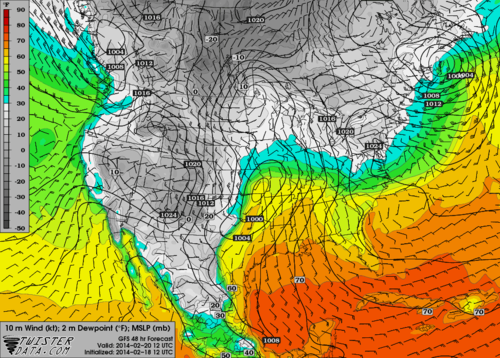 Instead we get warm, drier air moving into the mid-levels which is actually stopping any deep convection from forming. However, it is only a matter of time before there is enough forcing due to the approaching front and associated upper-level dynamics to burst that cap on the atmosphere. When this occurs, there will be sufficient amount of unstable air present in the mid-levels of the atmosphere to make for some strong to severe thunderstorms. The above image shows the Lifted Index, which is just one variable that meteorologists look at to gauge severe storm POTENTIAL. This does not necessarily mean severe weather will occur, but this particular variable indicates that the atmosphere will be unstable by mid-day Thursday. Once storms along the cold front have fired, we will need to keep a close eye on any rapid increase in strength as very strong winds will be present just above the surface (about 2,000 feet). When any of these thunderstorms become intense their downdrafts can carry these 60 mph+ winds to the surface quite easily, and the result is a straight line wind threat we have previously mentioned. One thing that is fairly uncertain at this time is where and when the line of storms will fire. This plays a big role in whether or not we experience severe weather in the Mid-South. If storms are able to get going, they will likely be forming in the early afternoon just to our west. Thus, the best opportunity for severe weather in the Memphis metro will likely be during the afternoon hours, when we are also at peak heating for the day (lower 70s temps) and instability is theoretically maximized. 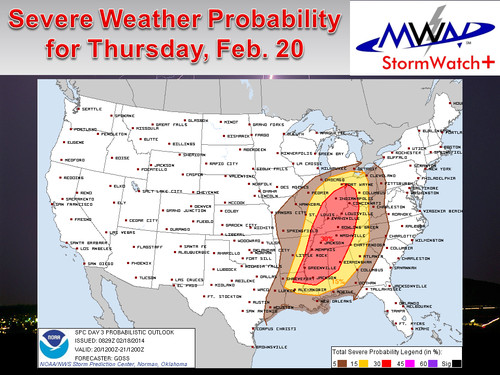 The Storm Prediction Center has the Mid-South in a Slight Risk with a 30% probability of severe weather Thursday. Storm mode primarily favors a squall line event. While a weak embedded tornado cannot be ruled out, our primary concern will be damaging straight line winds. However, this does not mean you should not prepare. Straight line winds can pose significant problems, as many in the Mid-South already know. Be sure to check out our daily blogs this week that contain severe weather safety information. It's also a good time to activate StormWatch+ on your mobile phones, which you will find in the MemphisWeather.net mobile app for Android and iPhone/iPad. For Severe Weather Awareness Week, the StormWatch+ upgrade (which basically puts a highly-precise weather radio in your pocket/purse) is 25% off! Download it, set it up for the locations you care about, and get some peace of mind when severe weather threatens! Finally, our SWAW webpage has a listing of the awesome giveaways MWN and our key partners are doing this week, including a ride along on a storm chase with Mid-South Storm Chasers and a free underground storm shelter from Take Cover Storm Shelters! Be sure to check it out, follow us on Facebook and Twitter for the latest updates, and tell your family and friends in the area where they can go for the only severe weather nowcasting service in the Mid-South! The Winter Weather Advisory has been expanded to include the remainder of the metro east of the MS River due to expansion of precipitation heading in our direction and model trends indicating that around an inch of snow will be possible most of the metro starting late tonight and lasting through mid-day tomorrow. An updated map is shown below. The morning commute could be hazardous depending on the exact start time of the snow. Temperatures are still expected to warm above freezing by tomorrow afternoon, helping to melt the snow, especially on roadways. The remainder of the original blog post below is still applicable. 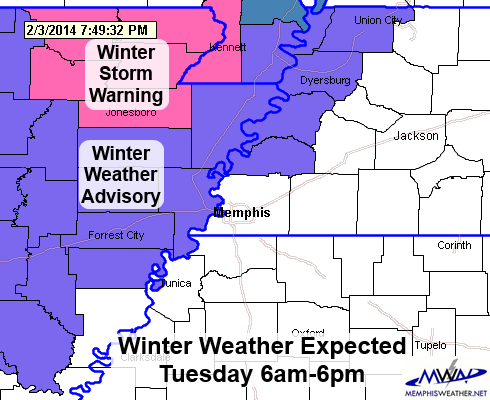 Winter Weather Advisory now in effect for the metro east of the MS River in purple. Added counties have blue outline. Winter Storm Warning still in effect southeast of the metro (pink color). Yet another winter weather threat has emerged, primarily for areas to our south and east. Following this threat is a distinct warming trend that most people in the Mid-South are probably about ready for. Beginning with the latest winter weather threat, we will once again be on the fringe of a major system. Our eastern and southern counties have been added to a Winter Weather Advisory (see map above) by the National Weather Service and this is where we expect the best chances for snow accumulation to be. Elsewhere in the metro light accumulations remain possible. The best time frame for this activity is from the very early hours of the morning tomorrow, tapering off in the afternoon. Due to low temperatures overnight in the low 20s, any amount of snow, but especially those that see an inch or more, will pose travel hazards from the morning rush hour through mid-day. 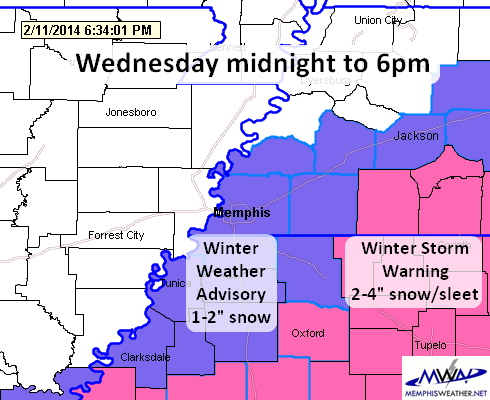 Northeast Mississippi, including Tupelo, could see several inches of snow. The disturbance that has been bringing our chances of wintry precipitation the past few days will finally push out of the area and bring its troubles to other areas of the southeast before shooting up the east coast heading into Thursday. In fact, if you have travel plans into northern Alabama or Georgia tomorrow, we strongly recommend delaying them. A major winter storm with significant ice is expected for a large portion of tee interior southeast, including potentially crippling amounts of ice in Atlanta. 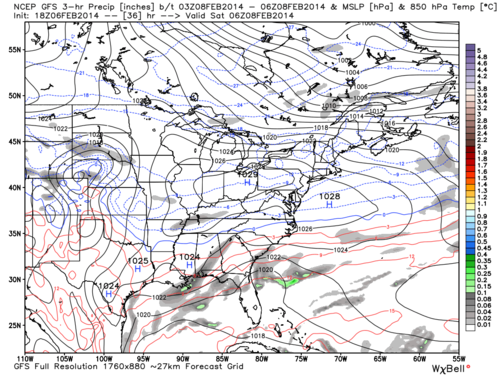 Meanwhile in the Mid-South, high pressure will begin to build in as the cold air is slowly eaten away each day. As a result we expect upper 40's for highs by Thursday, then lower 50's by Friday and Saturday. 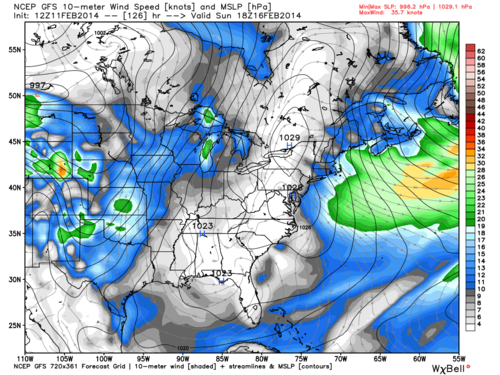 Southerly winds become dominate by Sunday and warmer, moist air is pushed in from the Gulf of Mexico. Lets check out some images detailing this more significant warming. 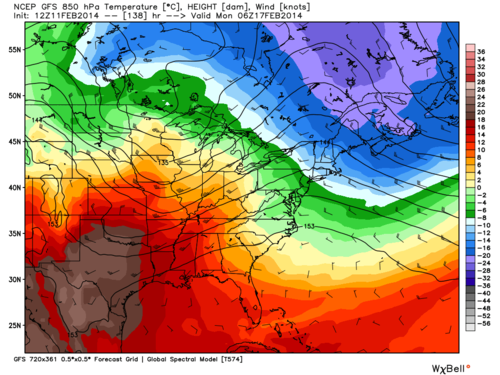 Warm low-level temperatures late Sunday night are advecting into the region due to the building ridge (above). Surface winds are cooperating during the day Sunday, with a high pressure in the area bringing southeast winds into the Mid-South (above). As a result, we expect warm days both Sunday and Monday (near 60), but perhaps the warmest morning in some time will come Monday morning with temperatures near 15 degrees above average (mid 40's in the morning). Check out the full MWN Forecast here and follow us on Facebook and Twitter for the latest updates. Computer models give, and they take away just as fast. What appeared to be our best shot of accumulating snow is now nothing more than another tease. Yesterday we were looking at models solutions that ranged from 3-5" snow, with one model printing out up to 9" of snow (no, we didn't advertise that then as it was an outlier) for the Monday-early Tuesday timeframe. Today that same outlier model (the NAM) is showing an inch or less north of the TN/MS state line with slightly higher amounts across north MS. The other two primary models, a global American-made one and a medium-range stalwart from Europe, are also lagging significantly in the precip department. Unfortunately, at 24-36 hours out, our confidence is now fairly strong that Tennesseans WON'T be seeing significant snow. That doesn't mean none - it means not a lot. Accordingly, the NWS has dropped the Winter Storm Watch over west TN as winter storm criteria (4"+ snow) likely will not be met. 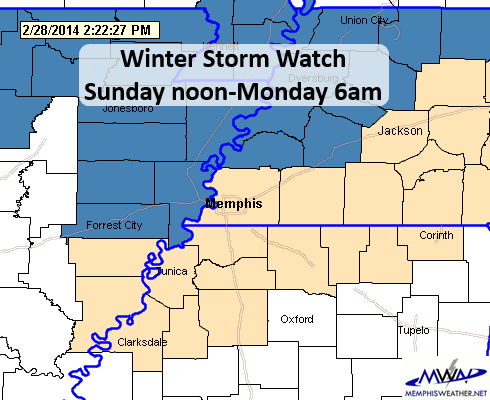 In addition, they pushed the start time of the Winter Storm Watch to 3pm for north MS, from Monday at 6am. There simply won't be enough precip around for most of the day tomorrow to justify a warning before that time. I still have some hope that a Winter Weather Advisory could be issued for the metro overnight tonight, but if totals continue to be less than 1", that may not happen. Right now, the NWS thinks Shelby County may see an inch Monday night, which is when the bulk of the precipitation will occur to our south. West TN will be on the northern fringe of the snow. An earlier upper level impulse (during the day Monday) could bring a light dusting to areas mainly north of Shelby/Fayette Counties, with very light snow possible in the immediate metro. Any time precip is falling, the bridges and overpasses will be susceptible to slick conditions due tn a lengthy cold snap of the past week. Even 1/2" of snow covered secondary roads on Friday night. 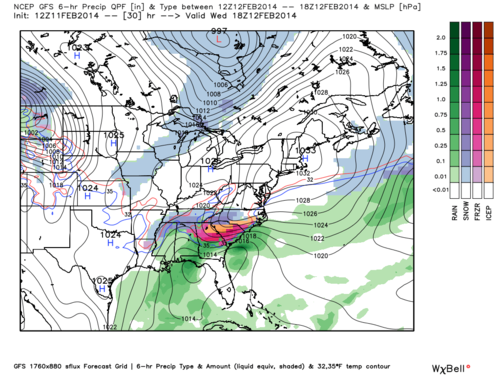 The bottom line: It's not a good forecast for snow lovers in west TN. Light precip is possible during the day Monday, mainly as light snow or flurries. Monday night will see a stronger system move across MS, which could drop a few inches south of the TN/MS state line and light amounts across the metro. Tuesday continues to be cloudy with a slight chance of flurries. 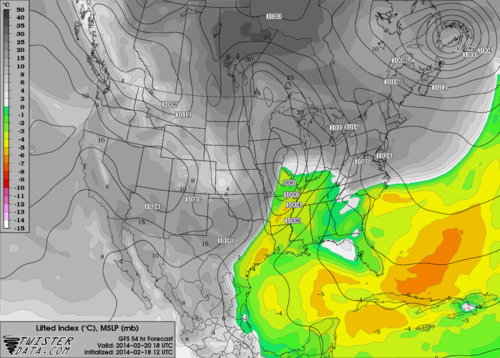 We'll also be watching another potential cold front on Wednesday night or Thursday which may bring precip. 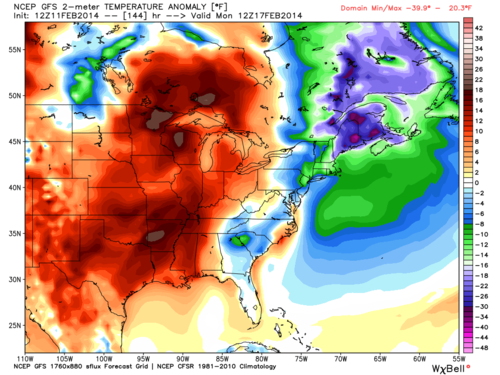 The good news for those sick of winter is that warmer temps look to arrive next weekend - finally!! Click here for the complete forecast from MWN. For those complaining about how we never get a "good snow" and were mildly disappointed in the 1/2" that fell overnight, your wish may yet come true! While details are still to be ironed out and those that we are looking at now will change between now on early in the week, it appears that parts of the Mid-South will see a good chance of a "significant" winter storm Monday into Tuesday. The NWS has enough confidence to issue a Winter Storm Watch from Monday at 6am through Tuesday at noon for the counties in blue below. We won't get into a lot of those details just yet, due to models still disagreeing on timing and totals, but the NWS has indicated light sleet could start early Monday and change over to all snow by late morning, continuing off and on through mid-day Tuesday. We believe that the heaviest snow will fall during the evening and overnight Monday night. How early it starts will affect totals, as well as when it ends. Early indications are that total snowfall could reach 3-5" by Tuesday morning across the watch area with lighter amounts, but still accumulatio, north of the watch, including Tipton County and points north. Temperatures will be in the mid 20s to near 30 Monday, drop into the teens Monday night, then remain below freezing Tuesday with teens once again Tuesday night. Snow could stick around for multiple days given the forecast temps and potential accumulation. Now is the time to start considering your plans for Monday and Tuesday. If the forecast holds, travel will become difficult to very hazardous, especially Monday night and Tuesday morning, even on interstates. If 1/2" of snow this morning cancelled ACT tests and other activities, it's likely that schools would be closed Tuesday, and perhaps Monday, given the current forecast. That obviously won't be decided until much later and we don't forecast school closings! If you're below 1/2 tank on your gas gauge tomorrow, go ahead and fill it up, if nothing more than for a little extra weight and traction. Have an ice scraper or snow brush in your car. We'll continue to bring you updated information as it becomes available and confidence in the forecast increases. Follow our social media feeds for that information, as well as our custom forecast and the latest radar and current conditions on the MWN mobile apps (links below). Finally, PLEASE do not be swayed by people that throw an extreme computer model solution up on social media just for hype or to be "first" with the information. They are out there, trust me (the models and people that do that). Help us put those rumors to bed when you see them. You'll always find a responsible, well-thought-out forecast, void of "extreme hype," right here at MWN. Now is a great time to share this source of information with your friends and family in the area if you like what we provide! No one would argue that January was unusually cold, marked by multiple intrusions of polar air into the Mid-South. Though not in the top 10, this month was the coldest January since the mid 1980s and 20th coldest in the nearly 140 year recorded history of Memphis. Despite the bitter temperatures, only one record was broken - a record cold maximum temperature on January 6. In addition to being very cold, the month was also drier than a typical January. There were no severe weather reports in the metro this month. Comments: Four days had high temperatures below freezing, 24 days had low temperatures below freezing, and two days had low temperatures below 10 degrees. Comments: One day with more than 1" of rain and only 2 days with more than 0.50". The last day with measurable precipitation was the 13th. A trace of snow (not measurable) was recorded on three days. Comments: Four days had high temperatures below freezing, 25 days had low temperatures below freezing, and 5 days with low temperatures below 10 degrees. Comments: Zero days with more than 1" of rain and only 2 days with more than 0.50". The last day with measurable precipitation was the 16th. A trace of snow (not measurable) was recorded on five days. Good chance of snow tonight, but how much and what are the impacts? This is an update to last night's post on the forecast for snow overnight tonight. 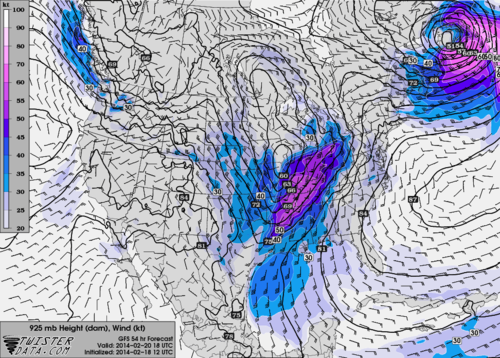 A fast-moving upper-level disturbance will sweep out of the Southern Plains and across the Mid-South overnight. With cold air in place and precipitation likely, we're expecting snow. Liquid equivalent amounts (if snow were melted) are expected to be light, under 0.10" and maybe closer to 0.05". However, converted to snow, that could mean 1/2"-1" by the time you wake up Saturday morning with the best chance of this amount north of the TN/MS state line. Minor accumulation is also possible across north MS. Confidence is high that we will see snow fall, not as high on amounts, though we don't see a circumstance where the forecast is wrong on the low end. This will not be a major snow, but it could be pretty Saturday morning! As for impacts expected, due to very cold air for a week ahead of this system, frozen ground, and cold streets, minor accumulations could cause some slick streets, especially elevated ones. If you will be out after dark tonight or early Saturday, exercise caution on the roads. A light dusting on a cold road can be slippery. 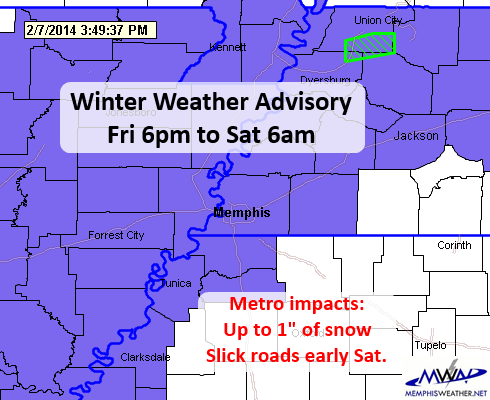 A Winter Weather Advisory is in effect for the entire metro except Marshall Co., MS from 6pm tonight until 6am Saturday. At this time, we have no comment on possible winter weather early next week. 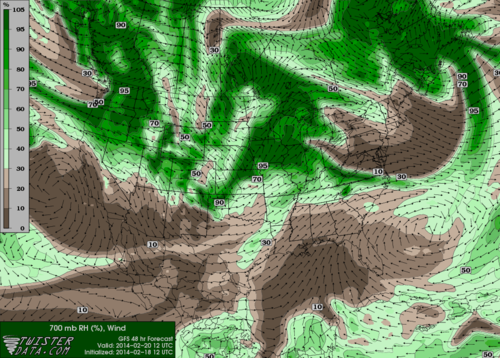 Models are in disagreement even down to when precipitation will fall, which makes figuring out precip type impossible. The only thing we can say is that it will be cold (but how cold?) and at least one, if not two, systems could affect the metro between Sunday night and Wednesday morning. We'll keep you posted. Welcome to the MWN Blog! Let me preface this blog with a simple statement: snow is NOT guaranteed in the time frames that we will be talking about, but there is certainly the possibility for accumulating snowfall on multiple occasions in the next week. Now, based on the latest model guidance, there is a chance you'll be waking up to some some actual accumulated snow Saturday morning. As you can see, this meteorological map shows precipitation estimates over a three hour period late Friday night. This map shows accumulated snowfall through the entire Mid-South (less than half an inch, or a "dusting"). However, this weather map indicates that during that same period accumulating snow is limited to north of the metro, and also only drops a very light amount (a dusting north of the metro). So you can probably see the problem we're facing. 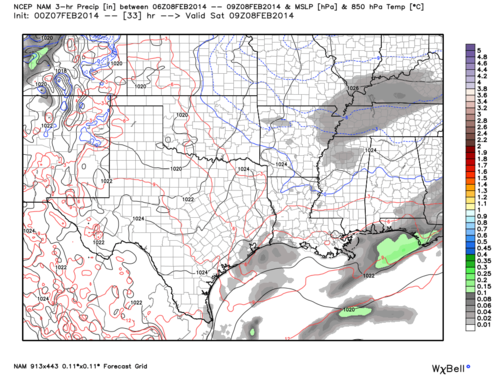 Models are undecided on where the snow will be even a short period away from the event. This is not uncommon. Liquid equivalent amounts (snow melt) are extremely light overall, and no one would care about this blog if we were discussing whether light rain would fall Friday night. What we do know at this point is that temperatures should NOT be a problem this time around! What we're dealing with here is a lack of moisture, plain and simple. Most of any snow that occurs Friday night will face its demise in the lower levels of the atmosphere, sublimating before it can gently reach the ground. If uplift can overpower the dry layer of air for a short period of time, those lucky flakes will become our very light accumulations Saturday morning before melting during the day. At this point I would put the odds of very light accumulations at about 50/50. As far as totals are concerned, a dusting is the most likely, with perhaps a half inch of snow as the highest amount (less likely than getting nothing at all). Therefore we do not expect much impact on the roads if you have plans on Saturday, especially since temps are expected to get above freezing and melt just about all of it. 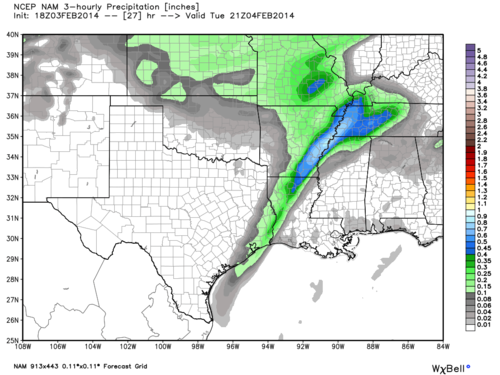 An early look at the beginning of next week suggests the potential for larger accumulations. Since this is several days out, we cannot speak on exact totals but can say that the set-up favors additional moisture but at the cost of borderline temperatures. We will have another blog detailing this next system this weekend. In the meantime you can check out the full MWN Forecast here and follow us on Facebook and Twitter for the latest updates. ACROSS THE MIDSOUTH AS AN UPPER LEVEL DISTURBANCE MOVES INTO THE AREA FROM THE WEST. LITTLE OR NO ACCUMULATION OF SNOW IS EXPECTED. LIGHT SNOW IS POSSIBLE LATE FRIDAY AFTERNOON AND FRIDAY NIGHT AS ANOTHER UPPER LEVEL DISTURBANCE MOVES INTO THE AREA. LIGHT SNOW ACCUMULATIONS ARE POSSIBLE...GENERALLY AN INCH OR LESS. 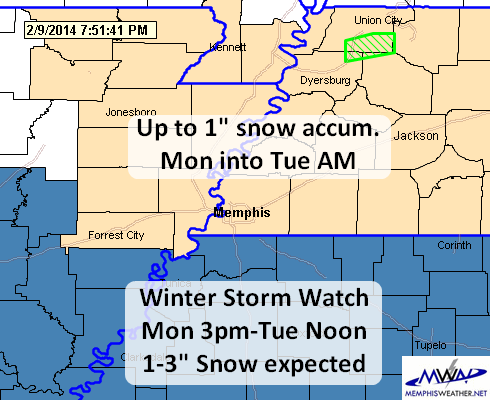 A VARIETY OF WINTER WEATHER IS POSSIBLE ACROSS THE MIDSOUTH NEXT WEEK FROM MONDAY AFTERNOON INTO WEDNESDAY. SNOW... SLEET AND FREEZING RAIN MAY OCCUR. IT IS TOO SOON TO DETERMINE IF ANY SNOW OR ICE ACCUMULATIONS WILL OCCUR. LATER FORECASTS SHOULD BE MONITORED. Any snow today will be merely of the nuisance variety and should pose no issues on roadways. There is no need to stock up on bread and milk! The event Friday night will need to be monitored, but it appears that 1" accumulation may be on the high side here in the metro. A dusting is more likely. Regardless, some slick spots could be possible Saturday morning if minor accumulation occurs. A more complete blog will address this system later today. As for next week, the event is too far out to draw any reasonable conclusions or attempt to define precipitation type or amounts or impacts. However it does appear that some amount of cold air will be in place and the metro could once again go in any direction precip-wise. As always, we will keep you informed as the event draws closer. 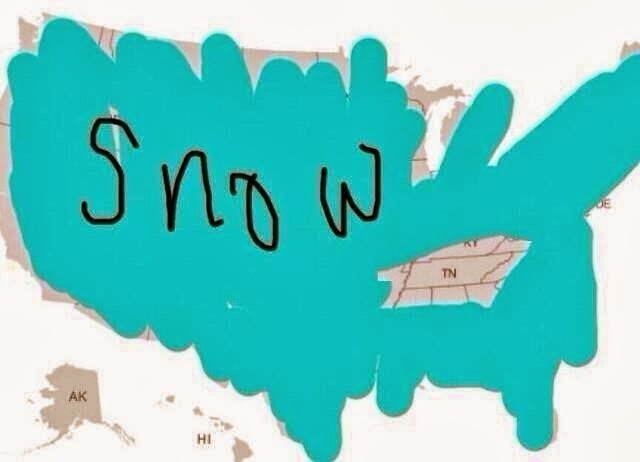 Winter weather forecasting in the South has a way of reminding us (meteorologists) that we are human and NOT in control. It reminds us that, though we know so much more than we did a year ago, five years ago, or twenty years ago, there is still so much more to learn. It reminds us that meteorology sometimes is more art than science. Indeed, it can be humbling. The winter weather forecast is THE most difficult forecast a southern meteorologist makes, bar none. After an event like Tuesday (and Sunday), I end up asking many of the same questions you, the public, do (although maybe phrased in my mind a little differently) even though I've been doing this for 17 years and have the training and experience to make a well-reasoned and educated forecast. Frequently, I hear things like "why does ____ ALWAYS go around us?" and "why does ____ NEVER occur in Memphis?" The questions I ask myself are similar, though they are phrased more like "why did it ____ THIS time?" and "why did it ___ THERE but not HERE?" First, there are no absolutes - it doesn't ALWAYS. As humorous as the picture to the left is, we DO occasionally get a "good snow" in Memphis. I submit Exhibit A, from February 8, 2010, below. Bartlett, TN - February 8, 2010. See, we do occasionally get "good snow!" There are many possible answers to your questions, as well as those that I have about why the atmosphere behaves the way it does. I'd like to borrow a couple thoughts that I happen to agree 100% with that I heard on a national weather-weenies podcast called "WeatherBrains" Monday night. The topic was the Birmingham/Atlanta winter weather debacle the previous week. I think the points are appropriate here as well. Winter weather in the south is something that we don't get a lot of practice at, and when it does occur the impact is much greater than the same event "up north." Combine those two facts together and you have a recipe for disaster. When an atmospheric setup occurs over and over again, it gets more predictable, or at least we know the range of potential outcomes. When it happens a handful of times a year (at most) and every one is a different shade of grey, it becomes that much harder. 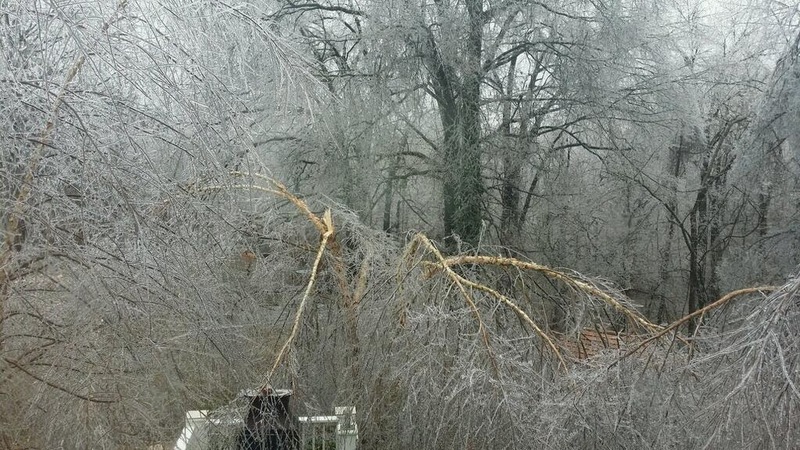 Significant ice in Randolph, Tipton County, TN. Photo credit Kent Cates. If the possibility of severe weather exists, most everyone knows. Whether they understand the threat is something altogether different, but there really are few true "surprises" in weather forecasting anymore. Someone/somewhere has talked about the possibility. That wasn't true 20 years ago. And because the accuracy is much higher than years ago, it is now EXPECTED that we will be right most, if not all, of the time. That simply isn't the case and it's not because we didn't know about the possibility, it's because we made a forecast that we felt was the most likely outcome based on numerous possibilities. Folks, I'm not making excuses. When I miss a forecast, I go back and try to learn what went wrong and how I can do better. I am fairly confident this applies to most in my field. There are not a lot of jobs out there where the people in that industry are, as a whole, truly passionate about what they do. The weather community is one of them. It's generally a visible position, which means when we screw up, you know about it and we are open to criticism. And that's OK. You're upset and need a place to vent and the cause of your frustration is the guy or gal that led you astray. If I didn't want the criticism, I'd do something else. Thick skin helps in this business! What it tells me though is that you care! The information MWN provides is important to you (even if Facebook thinks otherwise and filters it...). Yes, sometimes I wish people would stop using the joke about "getting it wrong 50% of the time and keeping your job," but that's part of the job. So as to the past two events, which many seem to think were forecast busts, I'll offer this. Look 20 miles north or west from where your "forecast bust" happened. You will find significant impacts that caused the people in those locations to personally feel the effects. So it rained all day where you were. Did you know that when the Winter Storm Warning that "shouldn't have been issued" WAS sent, the temperature had stopped climbing and was sitting at 32.5, trees were actually icing up in many areas in the warned area, and power outages were increasing, all as torrents of precipitation streamed through the area? Heaven forbid a warning was issued and nothing happened. Perhaps you believe staying in a winter weather "advisory" rather than upgrading to a "warning" would have been more appropriate? Please, come sit in the seat of the warning meteorologist and play roulette with Mother Nature. I assure you that the National Weather Service did not upgrade to hype the event. When the atmosphere is already not acting according to plan and there is reasonable probability that it could take a turn for the worse, I personally would issue that warning every time. We simply are not good enough to draw a line around your neighborhood and exempt you from potential impact. A single degree made the difference between what Covington received and what most in Shelby County saw on Tuesday. And the models were already too warm by 4-6 degrees during that time. In other words, they were useless. Given the knowns and unknowns, the NWS unapologetically erred on the side of caution and we stand behind them 100%. 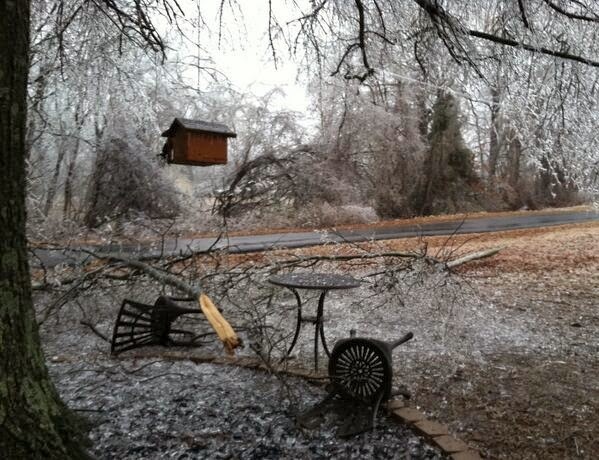 Ice storm damage in Ripley, TN. Photo credit Renee Nelson. Lastly, I think we in the weather community can do a better job. Not necessarily in forecasting the weather (though there is always room for improvement in that regard), but in telling you how it will impact you. Once again, I agree with my colleagues on WeatherBrains Monday night. We can tell you that you are under this warning or that advisory or you will get this much or it will be x degrees, but unless we tell you what that actually means to you, we have failed. We also need to do a better job of communicating uncertainty, rather than trying to be so cut and dry. At MWN, we try and provide impacts as much as we can, particularly in our forecast discussion blogs, knowing that in some cases we simply don't know what the impacts will be. We can provide an estimate or a range of possibilities when we aren't certain and we can do a better job of telling you what the probability is of something happening (though admittedly the public doesn't generally think in terms of probabilities - "just tell me what it's going to do"). However, we have to do better as an enterprise in that regard. We will continue to make that effort at MWN. I already have some ideas in mind. To all of you who have written or spoken your words of appreciation, thank you. It's a passion, it's exciting, it can be stressful, but it's the reason I do what I do each day. I'm not looking for kudos. I just want you to know that I always strive to improve, to figure out what went wrong when it does, and to communicate to you all in a way that you understand and will take action on. Thank you all for your continued support! Have a comment on the topic? We want to know what you think. Leave it below and we'll be sure to read it! Due to very heavy rain for much of the afternoon, flash flooding and stream flooding has become an issue across the area. An Urban and Small Stream Flood Advisory was followed quickly by a Flash Flood Warning for Shelby, DeSoto, Tunica, and southern Crittenden Co and points SW of the metro due to excessive rainfall. The updated map is shown below. While we were worried about ice on the roads for the afternoon commute, with temps up to 33-34 now across the area, the bigger concern is actually ponding and flooding on the roads. Stay with us for the latest via Facebook and Twitter. A continuous stream of heavy rain is training over the area from the southwest and reports are flooding in (literally in some cases) of ice accumulation increasing on trees and power lines with scattered power outages. 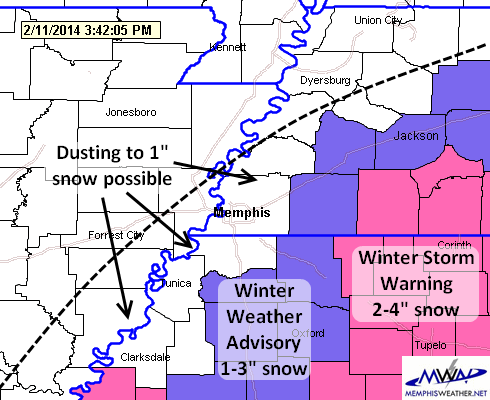 The NWS has decided to upgrade most of the metro, except Marshall and Tate Co, MS, to a Winter Storm Warning and extended the time until midnight. They are now calling for up to 0.40"of ice across portions of the area and minor sleet accumulations. The updated warning map is shown below. So far, roads seem to be in decent shape, likely because temps are near, not below, freezing and rain is falling so quickly that it is running off rather than freezing. We welcome all reports of accumulating ice and particularly hazardous road conditions. Drop them to us through our continuously updated streams on Facebook and Twitter. Another update to the advisories and warnings. 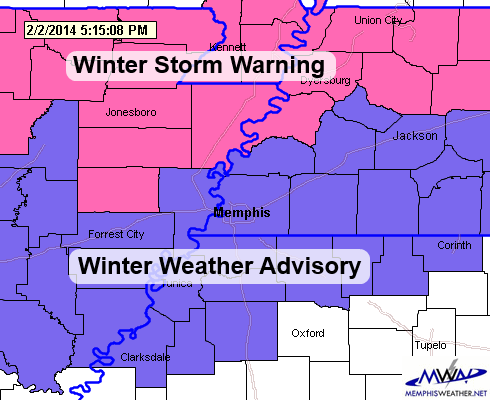 Tipton County now under a Winter Storm Warning until 6pm for ice accumulations of up to 0.40". The rest of the metro has seen their advisory extended until 6pm for accumulations under 0.25". See the latest radar below, as well as the current advisory and temperature maps in the previous update. Brief post on today's evolving weather scenario. It doesn't get much tougher than this. Temperatures are floating between 31-33 depending on the time you look and the weather station you look at. Some areas, especially north and west of Shelby County are seeing accumulating ice, while recent reports indicate some light icing starting to occur on exposed surfaces and trees in parts of Shelby County that was not there this morning. Temps will not trend in any particular direction this afternoon, staying just about where they are. Metro temps, updated every 20 minutes, are shown below. Fortunately the roads remain warm enough in the immediate metro for rain that is falling to remain liquid. However, as we go through the afternoon, some bridges and overpasses could see some slick spots. Some school systems in the area have announced early dismissal. A Winter Weather Advisory that was to expire at lunchtime has been extended for the metro, except Marshall County, through the afternoon hours (latest advisory map below). It's possible it could be extended again as we expect precip to continue through about 9pm. Overnight, periods of freezing drizzle are likely as low level moisture lingers and colder air moves in, dropping temperatures into the upper 20s. Significant icing is NOT expected in Memphis and Shelby County, however some areas will see light ice on trees, power lines, and exposed objects and bridges and overpasses may develop slick spots. More impactful icing is expected north and west of the city. Follow our social media streams below for the absolute latest on this very borderline winter weather scenario. Although winter weather just concluded last night, we once again have the potential to be dealing with some more frozen precipitation tomorrow morning. The National Weather Service has issued a Winter Weather Advisory for areas north and west of Shelby County, including Tipton and Crittenden Counties (see map below) starting at 6am. We're not expecting a lot of accumulation in these areas, with perhaps a tenth of an inch of ice possible, but this ice will add to already frozen power lines and trees, which could result in additional tree damage or utility outages, in addition to causing slick conditions on area roadways as early as rush hour. Outside the advisory area, a little light freezing rain is possible, mainly after rush hour, before all precipitation becomes rain. 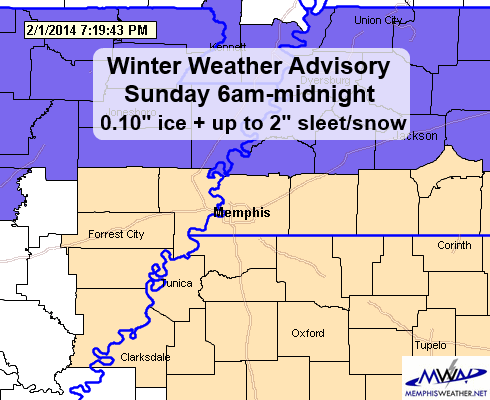 Very little or no ice accumulation is expected outside the advisory at this time, including in Memphis and Shelby County. It should be noted that although the Winter Weather Advisory extends until 6pm, precipitation should change to all rain in the metro no later than noon. At 8pm, temps are in the upper 20's and are not expected to move much overnight under cloudy skies with a steady breeze. Any precipitation that manages to fall in the early morning could be in the form of light freezing rain due to surface temperatures being just below freezing (especially north and west of the metro). By mid-morning we expect temperatures to rise just above freezing for most of the area with the possible exception of Tipton County and areas north of I-40 in AR, where it will take a bit longer to warm up. As the above image shows, this is also when the bulk of the precipitation will be reaching the area. 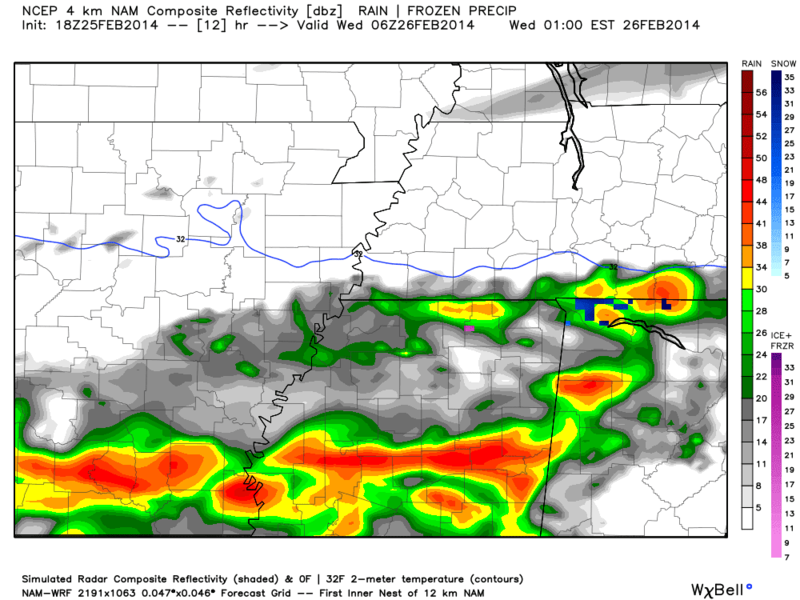 This weather model shows almost an entire inch of rain in a three hour period (noon to 3PM). So needless to say, heavy rain will be possible primarily tomorrow afternoon when the best atmospheric dynamics are in the area. Would not be surprised to hear some thunder during this time due to elevated atmospheric instability. The last of the precipitation will be moving out before 9PM, as the above image shows. Freezing temperatures are expected to reach the metro once again shortly thereafter. We are therefore not as concerned about freezing rain during this evening time frame but it will need to be monitored carefully. Cold and cloudy conditions look to follow for the remainder of the work week. Check out the full MWN forecast here and follow us on Facebook and Twitter for the latest updates. We'll have more on another potential winter weather event this weekend as time gets closer and models start to converge on a possible solution. An update to watches and warnings. All of the metro is now in a Winter Weather Advisory into the overnight hours. Temps have been sitting at 33.5-34.0 in the metro for the past couple of hours as precip continues to move across the region. Areas north of the metro have been seeing wintry precip already, from northeast AR into the bootheel of MO and northwest TN. These areas have been upgraded to a Winter Storm Warning for up to 1/4" of ice and 2-3" of snow/sleet. In the metro, a Winter Weather Advisory has been extended until 4am for Crittenden, Shelby, and Fayette Counties, as well as adding DeSoto and Tunica Counties. 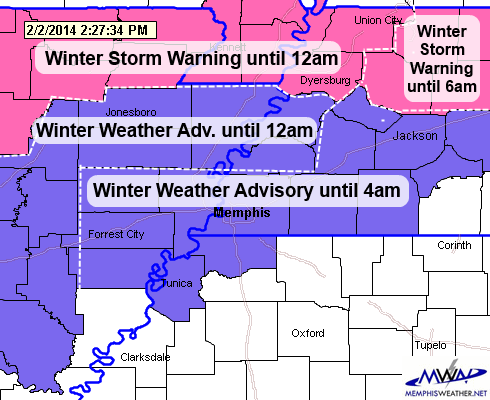 Tipton County remains under an advisory until midnight. Latest regional radar (auto-updating below) shows a lot of precipitation yet to fall as it moves southwest to northeast and the entire system moves east. The back edge of the precip will move out of the metro from west to east between 11pm and 3am. We're watching the freezing line slide slowly south and expect it to reach the metro between 6-9pm tonight (earlier north, later south). This is when rain will become freezing rain and ice accumulation would begin. Some sleet could mix in with the rain up to a couple of hours prior to the freezing line reaching your location, but any early sleet will not be an issue as rain will wash it away and melt it. After the temp hits freezing and until midnight or so, ice accumulation is expected to be in the 1/10-2/10" range for most under the Advisory. By midnight, precip will be tapering off but cold air will overtake the warm layer of air in the lowest couple thousand feet of the atmosphere, changing freezing rain/sleet to light snow and/or freezing drizzle. Total sleet/snow accumulation will be less than 1" on top of the ice and could be a dusting or less south of I-40. Temps will fall overnight into the 20s, thus any ice/snow that falls after dark will likely still be around in the morning. Untreated roads could become slick this evening and still be that way in the morning IF the expected accumulations pan out. Be sure to exercise caution, especially on elevated roads, bridges and overpasses tonight and Monday morning, including after Super Bowl watch parties. Alcohol and ice don't mix! No pre-treating of roads can be done when it is raining, so all treatment will be as, or after, ice forms. Just time for a brief update this morning. For further details, please see last night's blog post. The cold front has pushed through the Mid-South with temps in the mid 30s across the area at 6:15am. The drop in temps will slow considerably now though with nearly steady temps expected for several hours. This will keep most precipitation rain through at least the morning hours and likely into the afternoon. However with temps a couple of degrees from freezing, warm air aloft, and a cold pocket just above the surface, ice will be possible, in fact likely, before all is said and done today. By this afternoon, sleet will begin to mix in with the rain with initial reports expected to be in Tipton County and points north, shifting south into the I-40 corridor through the afternoon and into north MS by this evening. Only minor amounts of sleet are anticipated through sundown. By late afternoon/early this evening, temperatures will fall to freezing along the I-40 corridor, including Memphis and Shelby County, which is when rain becomes freezing rain mixed with sleet. By mid-evening this area could see precip change over to some snow and sleet as colder air aloft washes out the warm layer. Further south, north MS will see some sleet and freezing rain by mid-evening. All precipitation will taper off overnight, ending as very light snow or freezing drizzle. Ice (freezing rain) accumulations will likely end up in the 0.10-0.20" range with snow and sleet overspreading the ice. Ice is our biggest concern with this event. Snow/sleet amounts will likely range from an inch in Tipton County to a dusting to 1/2" in the I-40 corridor, to a dusting or less in north MS. A Winter Weather Advisory is in effect for Tipton County now until midnight and for Fayette/Shelby/Crittenden Counties from noon Sunday until 6am Monday. 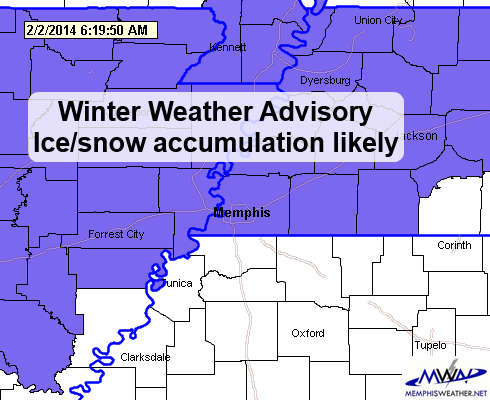 North MS is not currently under an advisory due to the uncertainty of ice accumulation. Not enough snow will fall to reach advisory criteria. This may change later today based on latest forecasts. Given the forecast, travel could become hazardous along the I-40 corridor starting early this evening, first on bridges and overpasses, then on secondary roads. Primary thoroughfares and interstates will likely take a few additional hours to become hazardous if they do at all. More hazardous travel will be found north of the metro starting later this afternoon while north MS is expected to have only minor issues, mainly during the evening hours. With temperatures falling into the 20s overnight as precip ends, there will be no natural melting of ice or snow before at least mid-morning Monday. Travel could remain hazardous for the Monday morning commute. Plan ahead. We don't forecast school closings - those decisions will likely be made early Monday morning based on road conditions. Temps will climb to near 40 Monday allowing ice/snow to melt for most of the area. We will have updated information throughout the day on our social media feeds, as well as via our forecast and radar products on our website and mobile apps (all links below). It looks like the Bluff City may finally get a shot at some winter weather after a month of cold temperatures but little winter precip other than flurries! The time frame of interest (or "concern") for most will be after dark Sunday evening. This blog post will focus primarily on the expected precip types, timing, and impacts. Rain overspreads the Mid-South tonight as a cold front moves through the region. Despite still being 65 degrees as of this writing (8pm), the front will usher in temps that fall nearly 30 degrees by early Sunday morning. Most of the metro, from the I-40 corridor south into north MS, will see temperatures in the 34-48 degree range tomorrow during the day, allowing occasional rain to remain liquid. 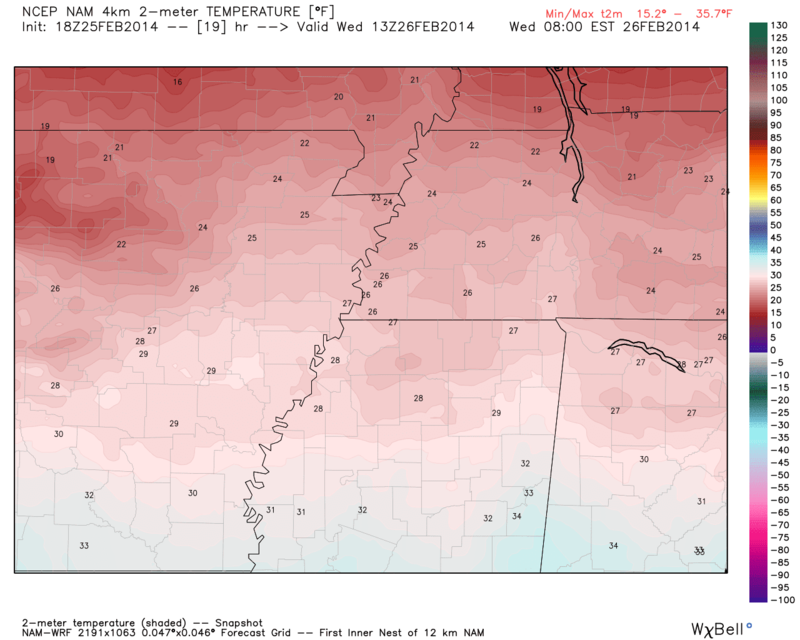 Hi-res NAM model forecast temps through Sunday midnight for Memphis Int'l Airport. 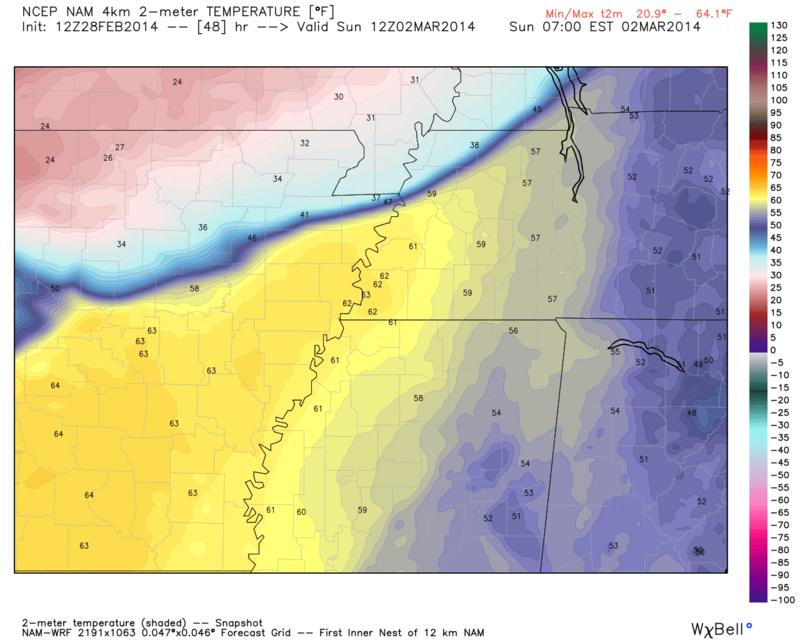 The model indicates 30s all day Sunday and 32 degrees by 7pm Sunday, when freezing rain would commence. Changeover would occur earlier to the north of the airport. By mid to late afternoon, temperatures in the I-40 corridor - including Memphis and Shelby County - will fall towards freezing and some sleet could mix in with the rain. After the Super Bowl starts (or roughly 6pm and later), the counties along I-40 will reach freezing as colder air seeps south. At that point, rain will become freezing rain with some sleet still possibly mixed in as well. The freezing rain/sleet mix will move south into north MS by mid to late evening, or likely by 10pm. Cold air aloft should change the ice over to light snow in the I-40 corridor by 9-10pm with precip tapering off after midnight as light freezing drizzle. 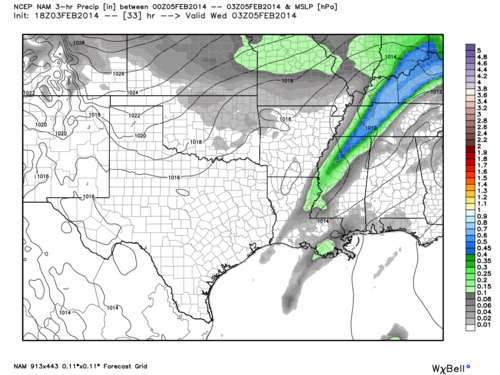 North MS could see a little snow but most frozen precip will be in the form of freezing rain. Below are the probabilities of 1" of snow and 0.10" of ice as issued by the winter weather experts at the NOAA/Weather Prediction Center. As you can see, the best chances of an inch or more of snow are north of the majority of the metro, though the graphic indicates there is a chance of up to an inch along and north of I-40. The heaviest snow will fall to our north where temps will be near or below freezing much of Sunday according to the Weather Prediction Center. Click for larger image. Our bigger concern will likely be ice. There is as fairly strong chance of seeing up to 0.10" of freezing rain and sleet. I believe that the freezing rain is more likely. Recall that freezing rain is liquid as it falls, then freezes on contact with surfaces that are at 32 or lower, creating a glaze of ice. It is the most treacherous form of winter weather for driving and power outages and downed branches and trees. There is a decent chance that up to 1/10" of ice will occur in the metro according to the Weather Prediction Center. Click for larger image. Most precipitation will end by midnight or shortly thereafter. In the metro, I expect we'll see perhaps one-tenth of an inch of ice topped by 1/2"-1" of snow (maybe a little more in northern Tipton Co with little to no snow accumulation in north MS). Note that there is still, just 24 hours before potential impact, some disagreement in the models as to the timing of cold air, which could push the changeover time of winter precip a little later, thereby reducing expected impacts. There will likely not be enough ice to cause downed trees or power lines, however roads will become slick during the evening, starting with bridges and overpasses then secondary roads. Main thoroughfares may still decent due to warm temperatures ahead of this system. Temperatures Sunday night will fall into the 20s so there is some concern for hazardous travel for the Monday morning commute as well. We won't know the exact effect until we see how much ice and snow actually fall, but prepare for that possibility. Temperatures Monday should climb to 40, rising above freezing by late morning which will help melt any ice and snow. I have no idea about school status for Monday morning. That decision will likely be made early Monday based on road conditions. We will have updated information throughout the event on our social media feeds, as well as via our forecast and radar products on our website and mobile apps (all links below). In addition, in the MWN mobile apps, be sure to add StormWatch+, our push notification-based weather alert system that will advise you of any warnings or advisories as soon as they are issued by the NWS.